Specialising in Roly’s handmade, traditional crumbly fudge, Matt and Shelley are the proprietors of Roly’s Fudge Pantry outlets in Salcombe, Polperro, Plymouth and Dartmouth. Before joining the Roly’s Fudge franchise family, Shelley worked in Roly’s in Totnes and Matt worked in a supermarket. 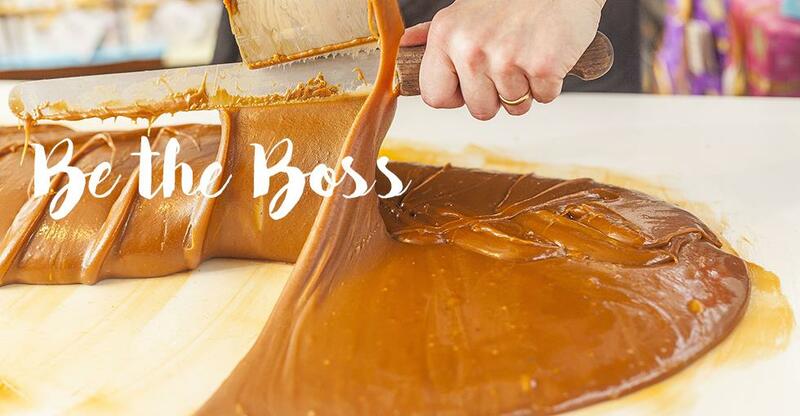 Now, they spend their days making mouth-watering fudge infused with local ingredients and seasonal flavours. We spoke to Matt to find out more. We have worked in retail from an early age and love the interaction with our customers. We both worked in supermarkets for years and I started managing a supermarket when we relocated to Devon in 2011. We now have two grown-up lads who are loving the Devon life too. How did it all start – why fudge? Shelley successfully applied for a part-time job at the local Roly’s fudge shop where she always shopped whenever we went on a family holiday to Devon. It’s the most amazing feeling to make fudge from natural, raw ingredients and then see the smiles and sales from very excited families on holiday. There is nothing like seeing our customers’ reaction when they can smell the fudge cooking in our copper pans and see it made right in front of them in the shop. Can you tell us about your journey into franchising ? Shelley enjoyed the whole fudge-making experience and realised we could open our very own Roly’s fudge shop using the franchise scheme. We started by finding a great location in Salcombe, Devon. The way the Roly’s franchise operated was explained to us and we knew we could make it work. The first year was so busy that I had to help cover shifts at our Roly’s fudge shop and then go and run my supermarket straight after. It was a lot of long days and hard work, but it was all worth it – especially when we realised that we could open a second shop because it had been so successful. I then gave up my supermarket manager job in favour of running my own Roly’s fudge shop. We have since gone on to open a total of four Roly’s Fudge Pantries in just two years. We absolutely love the concept of owning our own businesses through the franchise in the gorgeous location of Devon. What advice would you give to others aspiring to buy a similar business or franchise? It’s always hard work at the start and indeed ongoing. However, because it’s your own business and your own sales and profit, there is a huge sense of pride and achievement when you start to see the results of your efforts. We absolutely have fun at work with our ‘Team Fudge’ in every shop and this, in turn, creates a fun shopping environment for our customers. They love our fudge because we love making our fudge. We went to see Salisbury franchisees, Sarah and Steven - watch the video below.